Elk Grove to Renew $2,500 Annual Lease on Soccer Parcel Purchased For $4.4 Million; Taxpayers Being Conned? At Wednesday night's meeting, the Elk Grove City Council is expected to approve a $2,500 renewal lease on 98-acres it purchased in 2014 for $4.4 million with taxpayer money. Yes, that is right, the city will collect a single payment of $2,500 for the third year in a row in return for using the parcel for a winter hay crop. Why you might ask, did we pay so much for a parcel that is generating such a paltry return? That is the price Elk Grove taxpayers are paying to chase the soccer dreams, some say delusions, of outgoing Mayor Gary Davis. 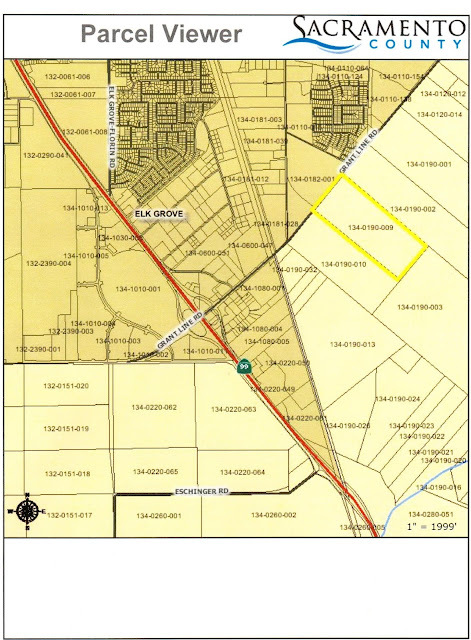 As Elk Grove residents will recall, in 2014 the City purchased the 98-acres located at 10251 Grant Line Road for $4.4 million. The parcel, which lies outside of current city limits, was the keystone in Davis' and former California Assembly Speaker Fabian Nunez' plan to bring a Major League Soccer expansion franchise to Elk Grove. That plan, which not surprisingly collapsed, was flawed from the start. Not long after the City bought the parcel, an MLS entourage rolled into Northern California and almost as an afterthought, paid an obligatory mercy visit to Elk Grove's rural parcel. Some have suggested Davis wants these fields so he would have an Elk Grove legacy. And of course, what better way to get votes than promise a large demographic in the city with some irresistible goodies. Never mind Davis and his City Council colleagues knew MLS Commissioner Don Garber has long been on record seeking expansion franchise stadiums in high-density downtown areas, the Mayor was undeterred. In his zeal to be a big-time player, Davis even suggested Elk Grove could pluck the Miami expansion franchise awarded to soccer superstar David Beckham. But surprise, surprise, when the MLS entourage paid their mercy visit, Davis mysteriously disappeared leaving then-Vice Mayor Jim Cooper holding the bag. Even though Davis' MLS plan fizzled, The Mayor pressed on promising throngs of soccer moms and their kids at several standing-room-only meetings that yes, we will build a $50 million soccer facility. That too seems to be going nowhere, which given the increasing evidence that there is an adequate supply of soccer fields, might not be a bad thing. So here we are, three years later, and the City will have collected about $7,500 on their $4.4 million investment. Benjamin Graham is rolling in his grave! Not only has talk of the soccer stadium and field disappeared of late, a competing facility in amenity-rich Roseville, Calif. will be attracting those supposed lucrative youth soccer tournaments while our parcel will probably be harvesting its fourth winter hay crop. Is this whole thing a confidence game by clever grifters operating on the Elk Grove City Council? Consider this - once the City purchased the parcel, it suddenly had a very convenient excuse to seek its annexation with the Sacramento Local Agency Formation Commission through the sphere of influence application (SOI) process. Of course, the 98-acres was not enough, and the SOI application expanded to include several hundred adjacent acres. So as the Roseville facility comes online in 2018 with the strong possibility it will capture the regional market for the coveted youth soccer tournaments, Elk Grove's proposal will become a riskier financial proposition as bond underwriters perform their due diligence. If the City Council fails to recognize this, indeed City Manager Laura Gill knows better. Let's not forget at one point Gill, with the backing of Councilman Pat Hume and former Councilman Bob Trigg herself tried to convince the Council to kill off the soccer proposal (see video below). Interestingly, it was just three months later the 98-acre parcel was purchased. If the soccer scheme collapses, not to worry. By that time the whole area will be annexed, and the developers will have accomplished what was stalled in 2010 when the City withdrew that portion from the bigger SOI application that currently lies in a state of purgatory. With no need for the soccer fields and our City's fondness for rezoning, the 98-acres can be sold for a tidy profit to any one of several developers who would love to build another 400 or so rooftops complete with a new batch of Mello Roos fees that will make residents in Laguna Ridge think they are getting the deal of the century. Taxpayers lose, but the developers and politicians win and two out of three ain't all that bad. Moreover, of course grateful developers might just end up calling the subdivision Davis Fields. Now that is a legacy!